A lawsuit was filed in late May by a few other families. Nearly 20 more are considering joining that suit. Pawsitive Service Dog Solutions is supposedly in the process of dissolving. PSDS has filed for Chapter 7 Bankruptcy (for the most part, this means they do not plan to exist anymore financially). The list of client complaints is growing, and growing, and growing….. In nearly every case, PSDS cannot provide financial data regarding their account, who gave what and for whom. Supposedly, their computer with the finances crashed. How convenient. PSDS has taken down their website and most social media accounts. Not to worry….I have numerous screen shots that I’m keeping for archiving purposes. Speaking of social media…a few weeks before PSDS shut down their Facebook page, Carmel posted a copyrighted photo of my daughter that she lifted from my blog (which I’m sure she monitors closely. Hi Carmel!!). It was taken by a third party photographer so I requested she take it down. She refused, citing I had signed in the contract that PSDS had the right to use photos of my child with the dog as a promotion for their company. This is true, but that contract doesn’t apply to photos who neither of us have the copyright to! Even after the owner of that copyright demanded she take it down, Carmel refused. So we sent FB a message stating copyright infringement for both FB and Instagram and they both removed the picture within hours. Checkmate. Patty Basile, the CPA who handled their finances (and who also was never able to provide a copy of our financial account), has since resigned from PSDS. In a unique twist of events, she has provided a legal declaration giving detailed information of just what went on behind the scenes…including the purchase of $7,000 blinds for Carmel’s house and the recycling of dogs. I’m serious…you can’t make this up! When a dog didn’t work out with one family, they changed its name and sent it to another unsuspecting family! I applaud Patty for finally seeing the light and I hope she continues to share information that might one day help all these families recover their money that is needed for real service dogs. If you want to file a complaint with the AG, you can do it here: http://oag.ca.gov/sites/all/files/agweb/pdfs/charities/charitable/ct9.pdf The more the merrier. The IRS has been notified of the improper tax returns that PSDS filed. They filed the return designed for non-profits with less than $50,000 in total revenue. But the former PSDS website stated they had placed at least 47 service dogs. With an average cost of about $13,000 per dog and the company only being in existence for three years….the math is very easy. I guess lying is easy also. The IRS doesn’t comment on existing reviews of non-profits, but I suspect it would be fairly easy to prove some level of tax fraud. In addition to all of this, the media has gotten hold of this story. There are several news outlets that have covered different angles of the Pawsitive Service Dog Solutions scam. So for the convenience of everybody searching for the latest news report, here are the ones that I know of. If you have seen others, please comment and leave me a link. I’ll update this post with each new link. UPDATE: Due to some confusion regarding the abilities of Hazel the dog, please see the update below for clarification. My wife and I hired Pawsitive Service Dog Solutions (located in Yuba City area in northern California) in the hopes of getting an autism service dog for our daughter. If I could do it over, I would NEVER hire them and certainly do NOT recommend them to anyone looking for a service dog. If you are researching and considering hiring Pawsitive, please read on and consider this a warning. 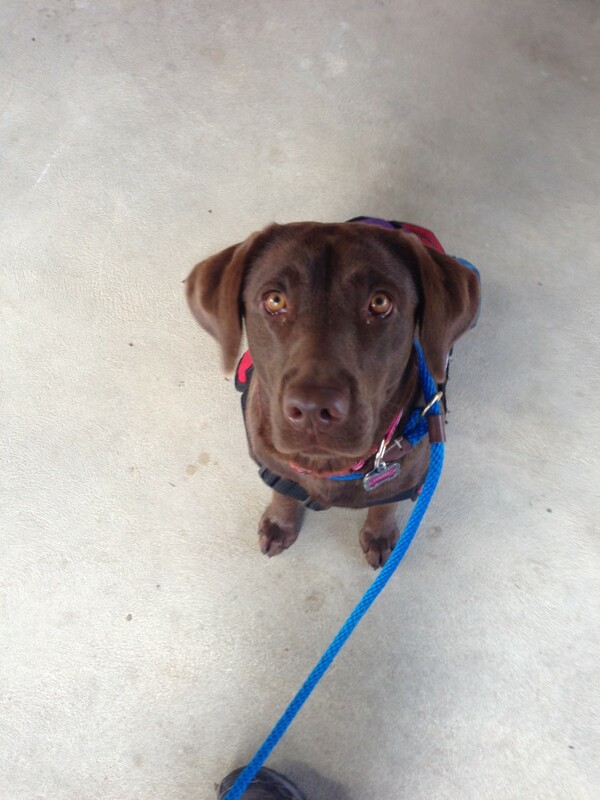 After signing the contract and waiting an agonizing year, we were given Hazel, a beautiful chocolate lab to help keep our daughter safe and close to our home. For the most part, Hazel is a good service dog. (Update regarding Hazel’s abilities at the end of this post). She has certain quirks and is still mastering certain techniques that we think should have been mastered before she came to our family, but with constant additional training we have been giving her, she is progressing well. The trainer who had Hazel last suspected that she was a bit young and still had a lot of energy and didn’t seem to have been socialized well. We were desperate to get Hazel into our family to help lower our stress levels and keep our daughter safe, so we agreed to take her just a tad earlier than what the trainer normally recommended. As such, she needs some additional socialization and a little extra work. We’ve come to accept this challenge and really do not have much issue here. The service dog is not the problem with Pawsitive Service Dog Solutions. The problem is the people who run and work for Pawsitive. As a business owner, I understand the nature of working with clients, handling finances, and dealing with difficult circumstances. I also understand that the most important aspect of client-relations is communication….none of which Pawsitive seems to understand. For a non-profit organization, I have never experienced such horrible client-relations as I have with Pawsitive. We paid a lot of money and many of our friends donated money on our behalf to an organization we had no previous relationship with (as would happen with a vast majority of their new clients). As a result, I kept good records of every communication we had with them to the detail of date and times we talked or texted and emailed. I could spell out each and every detail, but to prevent this post from being too long, I’ll only provide the main points. I really tend to not speak negatively about other people or businesses online, but during the course of dealing with Pawsitive, I realized there were probably a lot more people like me in this position. The way the contract is written, they hold all the cards. It would be difficult to try and force their hand in any particular situation because then, all of a sudden, the dog may be “delayed more.” I’m not convinced this happened in our case, but the thought certainly crossed my mind. Given their inability to effectively communicate and tell the truth, I wouldn’t put it past them. These are not in any particular order, but they’re all important. The biggest issue (and very important in my opinion), is that Pawsitive cannot provide you with any sort of legitimate status of your financial account. We paid money, friends and family donated money, and businesses donated money all on our behalf. “How much have we raised to date?” I would ask on several occasions. In the rare instance I got an email or phone call back, I merely got a total number. Although we were constantly promised that we would get a full accounting of who gave what on our behalf, we have NEVER received a full list. On two occasions, Patty (who handles development and finances) called and gave us a couple figures over the phone with names and promised to “send a written copy tomorrow when I get to the office.” The most recent response I got was an email with a few names attached to a few dollar amounts. The problem was that several dollar amounts had no names on them and several names were missing….namely my in-laws’ donation and the donation from MY OWN COMPANY. Now here is the thing….Patty is a CPA during the day and works with Pawsitive in the off-hours. So a CPA is handling all the finances and donations and is completely unable to provide any sort of financial record to a client? Wow. If any of my clients wish to have a record of their purchases/payments with my company, click, click, click, I email the information and we discuss any discrepancies. Apparently, for Pawsitive, this is incredibly difficult. So here is the question regarding their financial dealings…. What are you hiding? Why can you not provide me with a detailed list of who gave what on my behalf and provide a total? Why do you not send out donation tax-receipts at the beginning of the year to anyone who donates to Pawsitive? I understand it is not a requirement by law, but a vast majority of non-profits do as a courtesy to their donors. After numerous attempts at getting this information from Pawsitive, I must come to the conclusion that; 1) they simply do not care, and 2) they are incapable of handling their donors needs and finances well. Little E and Hazel. Photo by Sweet Nectar Society. All rights reserved. As would be standard and appropriate, service dogs should be immunized in the same way other dogs are. The problem here, is that Pawsitive cannot provide proof that Hazel has had them. During our handler training, the trainer gave us a single sheet that supposedly had a record of Hazel’s immunizations. After a closer look more recently, we discovered this was not actually a list of immunizations. After calling the veterinarian that was listed on the receipt, we did get confirmation that Hazel got a standard set of immunizations several months after being born. Specifically, the rabies shot that was given was set to last one year. Nothing since. Hazel is almost two now. In an attempt to give Pawsitive the benefit of the doubt (I’m not sure why), we asked if they had a record of her immunizations…perhaps they used a different vet that we do not know of. We had to ask several times and, finally, we received a handwritten record of dates and immunizations that were supposedly given. However, there is no listing of rabies vaccination except for the one listed above. So as far as we can tell, Pawsitive gave us a service dog that has not had its full standard set of rabies immunizations that are required by California law. This leads us to question the validity of the other immunizations as well. This begs the question….what else did they not do for the dog that we are unaware of?? Have you noticed yet how awesome their communication is with clients? Yeah, awesomely horrible. When we were still researching and considering all our options for a service dog company, Carmel (the director) was very communicative and friendly and answered all of our questions. After we sent in the signed contract, we’ve only spoken with her a handful of times and most of our voice mails and emails got ignored. Our contract stated that the placement of a dog would take 9-12 months. Ours took just under 12 months, so I really have no issue with the wait time. However, over the course of these 12 months, we were lied to as to the status of Hazel repeatedly. But this was only during the times we could actually get in contact with either Patty and or Carmel. On several occasions, Patty told us that Hazel was just a few weeks away from being placed. These comments started around September of 2013 and continued for several months. Then…all communication stopped. In late January, I sent several emails to Patty with no response. I left a voice mail a few days later. No response. Several days later, I sent an email to Carmel in hopes she would follow up with Patty. To my surprise, she did and said Patty had never received a voice mail. Lucky for me…my iPhone says I called on Wednesday, February 5th at 7:41 pm and spoke for 1 minute. Like I said…I have detailed records. Here’s the thing….my wife and I have been through two international adoptions. I understand waiting. I understand that sometimes things happen that create unintentional delays. I really do! But instead of lying in an attempt at keeping the client happy, just tell the truth and say you’re working on it. With both of our adoptions, certain circumstances beyond the control of our agency created unexpected delays that we didn’t like. But our agency was forthright and honest about what was going on. I think most people would appreciate knowing there is going to be a delay because of XYZ, rather than being told repeatedly that everything is okay and starting to notice on their own that things are really not okay. It makes the client question whether the company is being honest in how it handles its business. On several occasions, we were told by Carmel that “I don’t have access to that information. I’ll have Patty send it to you”….which of course, never happened. As a business owner, I fully understand how delegation works. But when the same client keeps asking for the same information over and over and over again…something is clearly wrong with your system….or your people….or in this case, both. 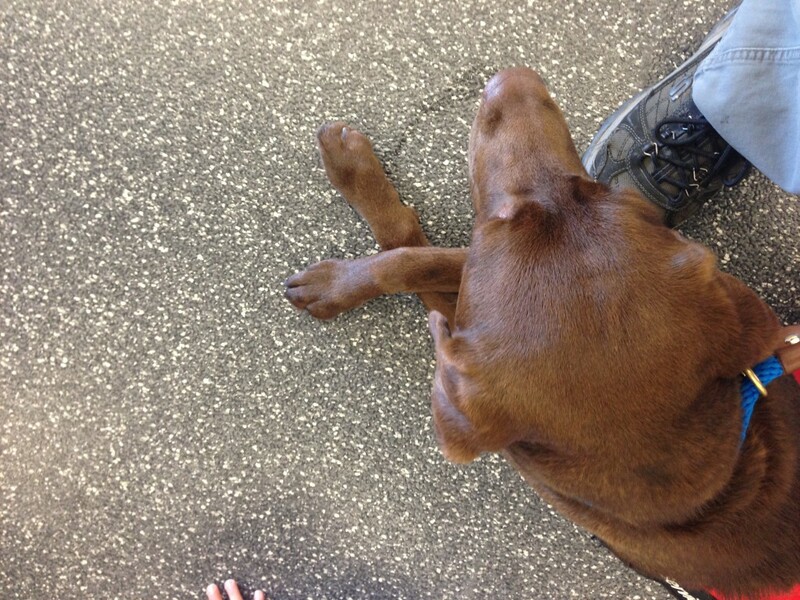 Her standard position while waiting…so proper! Is Pawsitive a Well Run Non-Profit? Not at all. If you put just these few examples together, this is what you get…. No standard report of the money you or your family/friends have donated on your behalf, substandard immunizations, constant inaccurate updates, and an extreme lack of communication. We’ve tried to be patient. We really have. We’ve given Patty and Carmel (and other employees there) every opportunity to make these issues right, to respond with updates, to provide the simple information we request. But they simply are unable or unwilling to engage in any sort of quality client relations. We simply cannot allow such a horribly run organization to continue without feeling obligated to warn other potential clients. Do all of their clients experience such lack of accountability and communication? I really have no idea. I hope not. I have been in communication with a couple other previous clients who experienced the same issues, so I do know it’s not just us. But now that we have Hazel, all the cards are now in our hands and we feel obligated to warn others of their incompetence. We mean no ill-will toward anyone at Pawsitive. We’re not out to get Patty or Carmel or anyone else who works there. But we feel compelled to warn others of how they operate the company and deal with clients. I cannot and will not recommend Pawsitive Service Dog Solutions to anyone. The dog is fine, the people there are not. Perhaps when I have time, I can write in more detail about some of the other issues we had with Pawsitive…like how we were told we got to provide our own code word for Hazel, but then found out that wasn’t what the trainer was told to use….or the time we were told Hazel would be ready for placement “just after Thanksgiving”, but that was not the case. With our own digging, we found out that she had just barely been sent off to be spayed…pretty sure that’s not part of the placement, instead something that is done way ahead of placement. We have lots of stories to share! Have you experienced issues with Pawsitive? If so, please let me know and leave a comment. Here is some clarification on the abilities of Hazel. There seemed to be some misunderstandings about just how good Hazel is as a service dog and rather than rewriting my whole post, I’m just adding in this bit of information to clarify a few things. We did NOT get what we paid for. 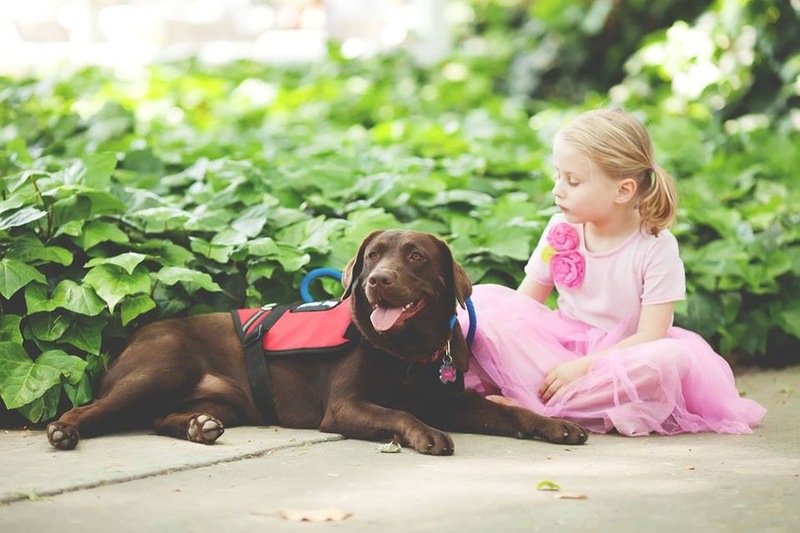 At the total cost of over $14,000, Hazel did not show up for placement as a fully trained autism service dog. She pulled on the leash continually, only found my daughter during scent tracking 50% of the time, and failed to have any sense of understanding where my daughter was and whether she needed any sort of help at all. In addition, she had not even begun any sort of training to notify us if my daughter began climbing the fence. Hazel does not possess any sort of innate ability to care for my daughter or keep her safe. So why did I post above that the dog is fine? Because WE made her that way! My wife and I decided that WE would have to train her since Pawsitive Service Dog Solutions did not complete the job. Rather than continue to complain to Pawsitive and be frustrated with the fact they rarely return phone calls, emails and texts, we simply decided to take matters into our own hands. Clearly, we proved to be more competent than they were. After spending hundreds of our own dollars on additional training, after spending countless hours of our own time completing (and in some cases BEGINNING) training for Hazel, she has started to act like a real service dog. So is Hazel a decent service dog? She is certainly getting there. Is it because Pawsitive Service Dog Solutions trained here well? Absolutely not. Did we get what we paid for? Definitely not.